The Mission Critical Institute advances cybersecurity careers and thought leadership by developing career path focused cybersecurity education and training programs for use by universities and cybersecurity employers. These programs produce billable, job-ready cyber professionals. In addition, MCI provides strategic cybersecurity consulting services to employers and higher education institutions. Hear from a top cyber security employer exactly how you can get hired for a cyber breach prevention job without a degree in this four-part webinar series. Let Rob Chubbuck, senior cyber security expert at CACI International, tell you how he decides to hire candidates without degrees to cyber security teams. 1. How big is the opportunity for cyber breach prevention? 2. How fast is that opportunity growing? 3. Why will he consider candidates without a degree? 4. What skills does he look for in a candidate? 5. What tools does he want a candidate to have experience using? 6. What experience should a candidate have for him to consider without a degree? 7. What personal characteristics are essential to him? 8. What academic credentials does he want a candidate to have? 9. What additional academic credentials does he want a candidate to earn? 10. What certifications does he want a candidate to have? 11. What additional certifications does he want a candidate to earn? 12. What does he look for in a resume to schedule a phone screen? 13. What must a candidate do in a phone screen to get the interview? 14. What kinds of questions are asked in the interview? 15. What answers does he look for? 16. What professional development plans does he want candidates to have? This unique webinar series will tell you exactly what motivates an employer to hire a candidate without a degree into a top cyber breach prevention position. Seating is limited to 75, so register now to reserve your spot! ADDED WEBINAR BENEFITS: Register for the webinar and download the attachments to prepare for the interview. Download the CCRMP Career Readiness Assessment and schedule an interview with an MCI Cybersecurity Education Specialist to fast-track your cyber security career today. Also included are complimentary $500 CISSP Exam Vouchers and $1995 CISSP Exam Prep Course Vouchers. Cyber Cloud Technologies has partnered with MCI to fill their need for job-ready Certified Cloud Risk Management Professionals and they need certified professionals now! CCT has a growing need for cyber/cloud security professionals with hands-on project experience to prevent cyber attacks. They offer tuition reimbursement to candidates earning your CCRMP. Register for our webinar and find out how to qualify! This webinar shows you how to advance your cyber career at CCT, qualify for CCT tuition reimbursement. Join our webinar to find out how you can achieve cyber security career success now! At the webinar, you can also download our $500 CISSP Exam Voucher, $1995 CISSP Exam Prep Course Voucher, $1995 CCRMP Certification Fee Voucher, and our CCRMP Readiness Assessment to fast-track your cyber security career today! Employers need job-ready professionals who can block cyber attacks with the NIST Risk Management Framework. Major employers are hiring professionals who have completed NIST RMF/FedRAMP virtual internships into $100K+ jobs, even without prior cyber experience. Learn how you can get project experience with the NIST RMF Virtual Internship and certification vouchers, even as you work at your current job. Join our webinar to find out exactly how! The webinar shows how you prepare for key certifications including the CISSP, CEH and Certified Cloud Risk Management Professional (CCRMP) certification while completing your internship. Join our webinar to find out how you can achieve cyber security career success and block cyber attacks with our NIST RMF Virtual Internship and certification vouchers! Download our $500 CISSP Exam Voucher, $1995 CISSP Exam Prep Course Voucher, $1995 CCRMP Certification Fee Voucher, and our CCRMP Readiness Assessment to fast-track your cyber security career today! Learn why employer’s find that certified NIST RMF/FedRAMP professionals provide the best breach prevention strategy. You will learn exactly what are the NIST RMF/FedRAMP tools and how they work. Then you will learn how certified professionals employ these tools to ensure enterprises establish the best breach prevention strategy. You will then discover what makes a certified NIST RMF/FedRAMP professional and why they are critical to helping enterprises create the strongest breach prevention strategy. Next, you will examine the strategies enterprises follow to build teams of effective, certified NIST RMF/FedRAMP professionals. Last, you will see how to become a certified NIST RMF/FedRAMP professional. The webinar covers the key certifications including the CISSP, CEH and Certified Cloud Risk Management Professional (CCRMP) certification. To help motivate interested candidates to pursue this career path, MCI offers qualified attendees access to complimentary $500 CISSP Exam Vouchers and $1995 CISSP Exam Prep Course Vouchers. 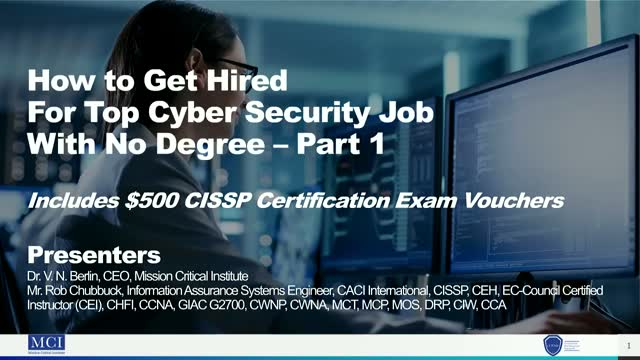 In this series, learn how to join the Cyber Elite and earn a $30K+ raise and a $500 CISSP Exam Voucher, even before you finish your cyber degree. You will learn what to add to your resume to get cyber employers to recruit you for top positions, even if you have not finished your degree. Then you will learn how to get employers to hire you. To motivate you to work to join the Cyber Elite in 2019, MCI offers qualified candidates CISSP Exam vouchers --- a $500 savings. In this series you will learn how employers pick candidates for $30K pay raises. •What project experience do they want? •What certifications must you have? •What additional credentials do you need? You will also learn about the rapidly growing cyber sector: cloud security risk management. During these webinars you will also review profiles of candidates who have actually gotten $115K+ cyber positions and why they were able to get those jobs. Plan to join the cyber elite in 2019. Use this valuable information to guide your cyber career planning decisions now. At this webinar, learn how Lisa and Mark got $115K+ senior cyber jobs (ISSO and Senior Security Assurance Analyst) when they became a hands-on Certified Cloud Risk Management Professional (CCRMP) and CISSP with MCI’s help. CISSP exam vouchers are available for attendees. * FInd out how Mark got his security clearance, too. You will learn how they earned their CISSP and CCRMP 100% online while they got cyber/cloud project experience that made employers recruit them for top jobs. You’ll find out who taught them, who guided their job search and how they received valuable employer references. Finally, you will learn how Lisa and Mark got their impressive cyber credentials in a single online program. Register for our webinar now! Register now and learn how Lisa and Mark got $115K+ cyber jobs with two key cyber certifications! *At the webinar, you will learn about a $500 CISSP Exam Voucher, $1995 CISSP Exam Prep Voucher and $1995 CCRMP Certification Fee Voucher.